Trick-or-treat! In the spirit of today’s sweet and spooky holiday, our team at Darbro Orthodontics would like to remind all of our patients to be safe while celebrating with friends and family tonight. Our friends at the American Association of Orthodontists were kind enough to provide trick-or-treaters with some tips for a ghoulishly good time. We suggest looking for foods that are soft, such as soft chocolate that can melt in one’s mouth or peanut butter cups. Otherwise, candies that aren’t sticky, chewy, hard or crunchy are generally acceptable. Dr. Donald Darbo and team wish you all a safe, fun and happy Halloween! At Darbro Orthodontics, we know nobody likes getting plaque on their teeth. Here are five other ways you can avoid that dreaded enemy of the teeth during orthodontic treatment, courtesy of WebMD. Let’s start with brushing regularly.. Brushing your teeth twice a day with a fluoride-containing toothpaste is vital to a healthy mouth. Make sure you softly brush all the surfaces of your teeth. Finally, before you pick up that candy bar, remember to not give in to your sweet tooth. Consuming sugary drinks or eating candy or other junk food allows sugar to stick to our teeth. The bacteria, then, becomes plaque, which turns into acid and damages our teeth. Avoiding these five bad habits keeps your plaque in check and your mouth as healthy as can be during your orthodontic treatment with Dr. Donald Darbo. If you have any questions, give us a call or ask us on Facebook! If you ever sustain damage to your braces and need to call Darbro Orthodontics, we can help you more effectively if you can tell us exactly which piece is in trouble! 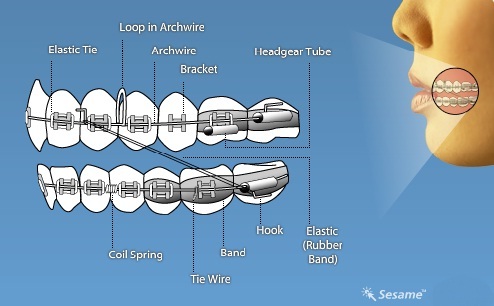 Here’s a handy diagram and corresponding list of all the parts that make up your braces. Archwire: The main wire that acts as a track to guide the teeth along. It’s changed periodically throughout treatment, as teeth move to their new positions. Loop in Archwire: Frequently used for closing space left by an extraction. Many archwires don’t have a loop. Bracket: Small attachment that holds the archwire in place. Most often, a bracket is cemented directly onto the tooth’s surface, eliminating the need for a band. Hope this helps! Give our Greenwood office a call if you have any questions! To promote a healthy and clean environment, Dr. Donald Darbo and our entire staff give a great deal of attention to sanitation and sterilization in our Greenwood office at all times, as well as following all requirements for sterilizing instruments and work surfaces. For the protection of other patients and our staff at Darbro Orthodontics, we always ask that patients reschedule their appointments if they have any type of cold or illness that can infect others. You are currently browsing the The Darbro Orthodontics Blog blog archives for October, 2011.